You are browsing the archive for Mel Calman. Crisis? What Crisis?, an exhibition of original cartoon artwork relating to various financial and political crises over the past 100 years, is part of the Watercolours and Drawings Fair at London’s Covent Garden. The fair runs from today (February 4) until February 8 and is held at the Flower Cellars, 4-6 Russell Street, Covent Garden. It’s the only place in the whole of London you’re likely to hear any laughter. The cartoon show includes works by dozens of cartoonists, past and present, including, Giles, Gerald Scarfe, John Jensen, Heath Robinson, Ken Pyne, Mac, Martin Rowson, Matt, Mike Williams, Peter Brookes, Steve Bell and Tony Husband. Since childhood Kate loved to draw and only ever wanted to be an illustrator. 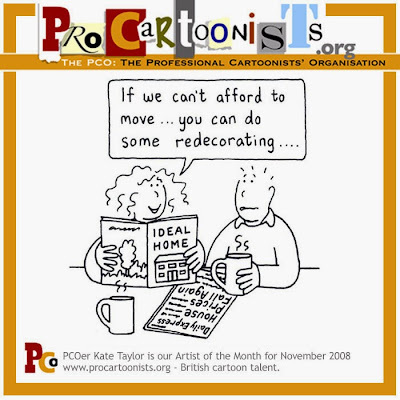 She has always worked as a self-employed freelancer, but, with her output always “veering towards” cartooning. MEL CALMAN called his autobiography What Else Do You Do?, after the question that is so often put to cartoonists. In fact, there appear to be many cartoonists who not only did something else, but found that that occupation eventually made their name, to the point where the career in cartooning became a largely forgotten footnote. 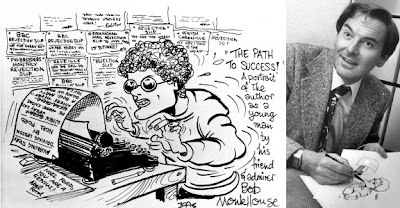 It was only after the death of the comedian Bob Monkhouse that I heard that he had once been a cartoonist. And quite an accomplished one. He had worked for Beano publisher DC Thomson. At about the same time, I read an article about the novelist John Updike and how he had been obsessed with cartoons as a child. Updike also tried his hand at being a cartoonist before coming to his senses and deciding that writing was the better path to take. It was certainly the more lucrative. Another writer who has dabbled with cartooning is Will Self. Some of his work can be seen in a compilation of his newspaper and magazine articles called Junk Mail. The drawing is crude but some of the gags are pretty good. BBC 6Music presenter Marc Riley, formerly “Lard” of Mark and Lard fame on Radio One, and an ex-bass player with The Fall, is another ex-cartoonist whose drawing was somewhat on the crude side. You may remember his Harry the Head from Oink! Comic. He also appeared in photo strips in Oink! He was the guy with the big nose. Another former cartoonist is broadcaster Andrew Collins, also an ex-New Musical Express journalist, EastEnders scriptwriter, Radio Times film writer and general overachiever. He chronicled his love of cartoons and half-hearted attempts to make a living drawing owls and wizards for puzzle magazines in Where Did it All Go Right and Heaven Knows I’m Miserable Now, his bestselling memoirs of growing up in the 1970s and 1980s. Talking of the NME, anyone who used to read the music paper in the early 1990s may remember a cartoon drawn in the style of Gillray called Dr Crawshaft’s World of Pop. But did you know that it was drawn by Arthur Mathews who went on to co-script the sitcom Father Ted? Comic Love is on BBC Radio Four at 10.30am on Saturday 19 July.